As TVs have gotten thinner, so has their sound. Adding a sound bar is an easy way to make your TV’s audio just as clear as its picture. A sound bar makes human voices easier to understand. Look for a model that has a dialogue enhancement setting. Some sound bars have simulated surround sound to make movie-watching more fun. If you like strong bass, look for a sound bar that comes with a matching wireless subwoofer. Models with built-in Bluetooth or Wi-Fi are great for music, too. Read the full story to learn more about sound bar designs, features, and mounting options. 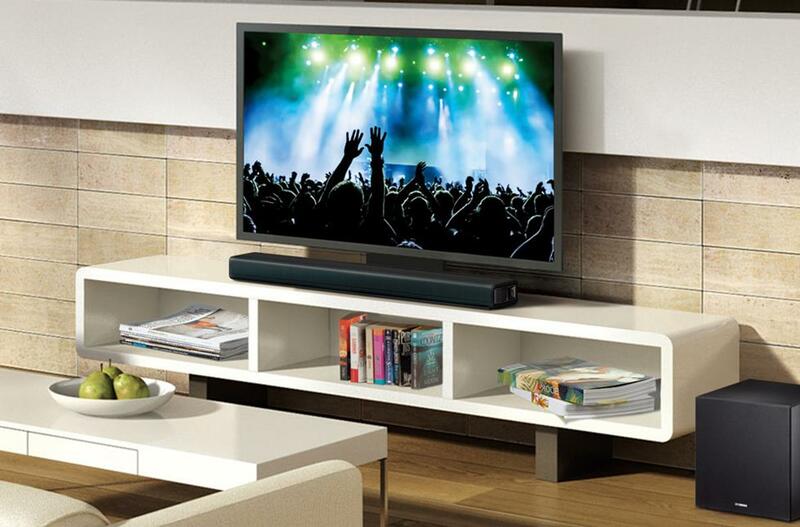 Begin your search for the best sound bar by setting your expectations. Do you want a low-cost bar that simply amplifies your TV sound? Or do you want immersive home theater sound? A bigger investment can get you sound quality that's comparable to a full home theater system. Now think about where your new sound bar is going to live. How big is the room? How big is the TV you're pairing it with? Big rooms and big TVs call for big sound bars. Compact models are great for smaller rooms and TVs, of course. 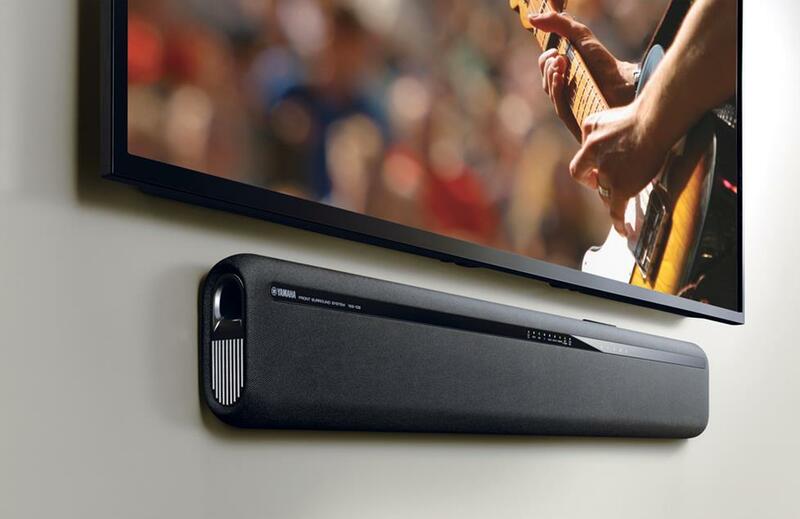 Will your sound bar also be your primary speaker for music? Look for a bar with high-grade speaker components and powerful amplification. Many sound bars offer wireless connectivity, and some even give you multi-room system capability. What does a sound bar add? Here are some features nearly all sound bars have in common, regardless of their size or price. Naturally, a sound bar will bring more volume and fullness to TV sound. That means you'll hear greater clarity, particularly when it comes to human voices. Many sound bars even have dialogue enhancement features, which make voices louder and more prominent in the mix. When you're watching TV at a comfortable volume level and a commercial comes on, the sudden shift in volume can be jarring. A lot of sound bars have volume leveling technology to ensure commercials aren't louder than show soundtracks. This is also good for late-night watching, so loud sound effects won't wake sleeping family members. If you don't have room for a multi-speaker surround sound system, you can still get thrilling audio from a sound bar. For the best sound with the most realistic surround effects, look for a multi-channel sound bar. They typically have five or seven audio channels, with discrete sounds assigned to each channel to create a three-dimensional surround effect. A seven-channel sound bar with the front grille removed to show the discrete drivers that simulate TV and movie surround sound. Some sound bars can actually reflect sound off your walls to trick your ears into thinking there are speakers all around you. In some cases, this effect can even be customized to your space. Sound bars with mulitple angled drivers, like Yamaha's Digital Sound Projectors, create realistic surround effects. Dolby Atmos enabled sound bars have special drivers that reflect sound off your ceiling. The effect is enveloping surround sound that puts you in the middle of the onscreen action. It's like 3D for your ears. Built-in Bluetooth® is a common sound bar feature that lets you stream music easily from your phone, tablet, or Bluetooth enabled computer. Some sound bars even have Wi-Fi® capability for quick access to online streaming services as well as your personal digital music library. A sound bar might also have a USB input, so you can load up a thumb drive with your favorite tunes, leave it plugged in, and listen to them anytime. Some sound bars even have support for high-res music files. Got CDs? Use your connected Blu-ray player to play them, and hear them through your sound bar. Your sound bar can also play a starring role in a multi-room music system. A growing number of brands offer sound bars that communicate with other music players, powered speakers, and receivers over a network connection, so you can stream wireless music throughout your home. What are your placement options? If you plan to place your sound bar on a stand in front of your TV, it's a good idea to measure your stand and your TV's base to be sure the sound bar won't stick out from the stand at all. Most sound bars can rest on your TV stand. To find the best fit, take measurements beforehand. You should also measure the space between your stand and the bottom of your flat panel so your sound bar doesn't block your remote control signal or part of the picture. If you aren't sure, a sound bar with a built-in IR repeater might be the best option, since your remote will continue to work even if the TV's remote sensor is obstructed. Some sound bars have a built-in IR repeater to ensure your TV continues to receive remote control signals with the sound bar placed in front. You may also be able to adjust the sound bar's height, so no part of the TV's picture is blocked. If your TV is wall-mounted, a sound bar mounted right under it makes for an elegant setup. If you're going this route, you'll need to consider how you'll hide the power cord and connection cable. Most sound bars have keyhole slots for mounting to walls. If your TV is wall-mounted on an articulated bracket, you may also have the option of adding a specialized sound bar bracket so the two pieces always move on the same plane. There is also a universal sound bar mount that attaches directly to the back of most flat-panel TVs. Placing a sound bar on a stand below a wall-mounted TV is a great option for sound bars that have more depth than your TV panel. This setup makes it easy to hide cables. 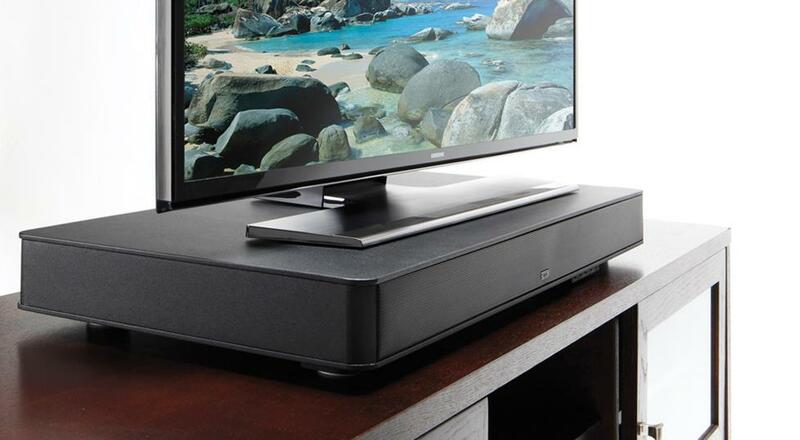 A platform-style sound bar supports your TV and blends in with its base. Check the specs for the maximum TV weight, and make sure the platform is wider than your TV's base. These might be your best bet if there isn't a lot of space between the bottom of your TV screen and your stand. They are also a great option if you're looking for full-spectrum sound without a separate subwoofer. A platform-style sound bar is a neat solution. Since the speakers inside are larger, it also has more low-end kick than a slim-profile bar. Will you need a subwoofer? A subwoofer is a speaker dedicated to reproducing only the lowest bass frequencies. Most sound bars are too slim to reproduce lower-frequency sound, so in many cases a separate subwoofer is included in the package so you can enjoy TV and movie sound the way it was meant to be heard. If you like action movies, video games, or TV programs that have a lot of bass, a soundbar/subwoofer package is probably best for you. Most sound bars come with a separate subwoofer, for deep bass and explosive sound effects. Most of them connect wirelessly to the sound bar for easy placement in your room. Most of the subwoofers included in a sound bar package are wireless. They only need to be plugged into a wall outlet for power, and the low frequency sound they produce is more or less non-directional, so you've got plenty of placement flexibility. If you don't have room for two separate pieces but still want good bass response, we recommend a platform-style sound bar. These broad platforms house larger speakers and give them plenty of room to resonate, so these sound bars have better overall bass response than their slim counterparts. The list of sound bars with wireless surround speakers is growing. You'll get more lifelike surround sound from this kind of system. And it's still easier to set up than a traditional home theater system. When choosing a sound bar, make sure you pick one with the right connections for your TV and other components. Nearly every sound bar has an optical digital connection, and many offer HDMI connections for more flexibility. If you have a multi-channel sound bar, using the HDMI connection ensures the best sound quality from Blu-ray soundtracks. If you have an older TV, there are sound bar models with analog inputs as well. For the latest 4K Ultra HD TVs, there are 4K video compatible sound bars. See our sound bar connection and setup guide to determine which type of connection is best for you. Once your sound bar is set up, you can use your existing TV remote to control its volume. Most TV and cable or satellite remotes can be programmed to control a sound bar, or the sound bar can learn your TV's commands. Sound bars usually do include their own remote controls, and often there are free remote apps that let you use your phone or tablet as a remote. If you have a sound bar with a lot of features, it's generally best to use the included remote or a remote app to control it.